I've been enjoying reading the PDF so far, It is well written and concise, not to mention the brevity and clarity of rules. I have a bit of a nitpick though, nothing serious or literally anything you should care about as It doesn't even affect anything at all. But "Table 20" and "Table 22" are completely identical, which is odd seeing the "Vehicle Combat" section states that it uses "Table 20" as well. Yes, this was mainly just to keep people from having to flip back and forth. I just bought a hardcover version. I thought it was possible to get the PDF whith the print !? Hi Julien, the PDF version of WWII: Operation WhiteBox is now available for free here. Thanks for your support. Be sure to check out our G+ Community for more discussions. Is there somewhere I can get character sheets? I bought the paper back revision. Also is there separate charts like for the GM? thanks. Hi Gerhardt V, email me at smallnichegames -at- gmail -dot- com and I will send it to you electronically. Just looked earlier today; where'd the b&w go? Hi Michael, a minor issue was reported to me with the B&W version. It's in the process of being fixed and I will update once it is ready. Still available on lulu.com if you just gotta have it. Thanks! Oh, good to know. Thanks for looking out. Actually, brings up a question: is the version here digest size? Yes, all versions are digest sized. The point was made that a full size book would look funny sitting on the shelf next to the other S&W books so the decision was made to stick with digest. I am a retired U.S. Army Special Forces Veteran that made the combat jump into Panama (1989), and also served in Desert Shield/Desert Storm (1990/91). Just seeing that a portion of each purchase will be donated annually to a Veterans' charity made up my mind to purchase this game (after my comment). I may even actually try it out to use some of my experience on the players/characters. Hello sir. This book was meant as a tribute to men such as yourself so I am honored you even noticed it and took the time to post. Thank you for your service. Also, the ranges you have on almost all weapons is woefully short. The average U.S. soldier is trained to engage targets up to 300 meters (roughly) 900 feet. A sniper can hit targets 2000 yards away. When firing the combat pistol course with...See more a M1911 .45, I consistently hit targets at 100 meters (300) feet. A regular soldier should be able to hit targets with the M1911 at 150 feet (50 yards). Whether you officially adjust this in the rules or not, I will probably use them in my game. As far as the rules themselves, I definitely LIKE the system!! You can tell that they are definitely taken from the old-school AD&D 1st & 2nd editions, which I have played since 1979. I will now have to look at your additional items under this title. BTW- My MOS (job) was a SF Weapons expert. Hi David! Yes I gave the M1 Garand the option to simulate "burst fire". It's not traditional burst fire in the sense of MGs and SMGs. I meant for it to simulate the rapid fire of the Garand as compared to bolt actions of the era. They would still expend around 3 rounds per burst. As far as ranges, remember the listed range is for short range. Multiple by 4 for extreme range (as per Ranged Combat rules). This puts most rifles around 200 yards which is a little better, but as you pointed out probably woefully inadequate for a truly trained operative. The system is designed as a loose framework (as opposed to a wargame simulation), however , so things like ranges can be easily increased to suit your home games without causing any problems in play. Now...if you rule it as a progression instead of straight multiplication, x1 would be 150' (or 50 yds), x2 would be 300' (or 100 yds), x3 would be 900' (or 300 yds), and x4 would be 3,600' (or 1,200 yds) which might be closer in line to what you were expecting. Also, if you don't mind me asking, please check out our WWII: Operation WhiteBox community on G+. There are many there (myself included!) who would find your real world special forces experience and expertise invaluable. Hahaha you are correct sir. Count that as habit from typing M1 Garand so much, just tacking Carbine on the end. I will fix this when next I update the PDF. Thank you. Edited: and be sure to let me know if you find anymore! You've mentioned land and aerial TotM combat, is naval combat provided along with sample ships as well? Asking because gamers would truly have all of the resources necessary for OD&D Modern then! If not, maybe consider a small PWYW supplement that would include rules for such things (along with swimming, breath holding, and drowning in the event of crashes even)? Also, are the TotM vehicle rules open game content? Hi Jerry, a patrol boat for littoral missions and combat is provided because the PCs might run afoul (or commandeer) one of these vessels, but the larger battleships and the like were a little beyond the scope of the core rules. Remember, the players are a special forces unit of some type. I would modify the Mass Combat rules to handle major naval engagements. In fact , I might draw up some quick and dirty battle modifiers for that. 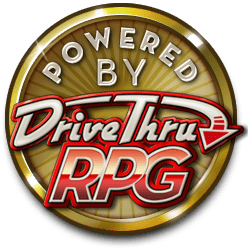 Just about every rule in OWB, including the vehicle rules, is open content. And I'm always happy to answer questions, so ask away! Good deal, will purchase then. Besides, I've dug your writing since the PIG/genreDiversion days. Y'know, some day I'd STILL love to see a space bestiary like the one you always wanted to do but never got around to ...even if it is for a different setting than HardNova 2. I keep imagining how different your creatures might have been from the roughly 90 I pulled off for HN2 R&E. Thanks Jerry! I've kicked around the idea of a White Star bestiary, just haven't pulled the trigger on it. OWB is keeping me pretty busy right now. "I remember my first trip to Europe as a young man. I felt blessed to see it, to touch the origins of my own country that I love so dearly. I hoped one day that all young Americans would have the same opportunity. Now hundreds of thousands will, along with Britons and Canadians, and European allies fighting to return home. "This kind of visit isn't what I had in mind. But if they do not offer the sacrifice of blood now, we will all pay dearly with added gallons later. "So if some must die, it is in a worthy cause." It just depends on how you read the "and." It could also be read "fought (and survived) and (fought and) died." I don't want to be that guy, but the men and women who "fought and died" are not our "living ancestors." They're dead. Maybe just ancestors.